When accused of a violation of probation, you should hire a violation of probation defense lawyer to help you, such as attorney Daniel Hilf. A violation of probation (also referred to as a VOP or a probation violation), if proven in court by an admission or after a hearing, places the probationer at the mercy of the Judge who is given the opportunity to sentence the probationer again on the original charge. Some Judges are more lenient and may be willing to give the probationer another chance depending on the severity and circumstances of the alleged violation. Other Judges feel that the solution to a violation of probation is to terminate probation and place the probationer in custody. The legal work your violation of probation defense lawyer performs may be the difference between sleeping in your own bed and serving a jail or prison sentence. loss of freedom through incarceration. Whenever you are before a Court for a violation of probation, you have to make a decision. One possible decision is to admit to the Court that you did violate probation. The other possible decision is to deny the probation violation and request a hearing. With either decision the best way to move forward is to hire probation violation defense counsel to defend you. If retained, attorney Daniel Hilf will provide you with expert legal representation, solid advice, and help you develop a strategy to face the probation violation in the best possible manner. to appeal in the manner permitted by the Michigan Court Rules. These rights only have worth and value if the probationer has a competent lawyer help to him or her exercise the above rights. Self representation is always the worst choice for a probationer, because the risks involved. In order to prepare and present the best possible defense or the best possible explanation for a probation violation, a probationer needs an attorney who specializes in probation violation defense, such as attorney Daniel Hilf. With every probation violation there is an arraignment, where the Judge informs the probationer of the nature of the alleged violations, and the Judge has the option of setting a personal, cash, or surety bond. Probation violation defense counsel may seek a delay in the probation violation for a number of different reasons including: need to subpoena defense witnesses; lawyer scheduling issues; waiting for the resolution of a pending criminal matter; need for additional time to prepare; desire to consult with an expert witness about a possible defense. The Judge is free to say yes or to say no to the adjournment request. If the basis of the probation violation is a criminal charge that gets dismissed, the prosecution and the Judge can still pursue the alleged violation. The reason that a dismissal does not automatically terminate a probation violation is due to the fact that the burden of proof for a new criminal allegation (beyond a reasonable doubt) is higher than the burden of proof for a probation violation (preponderance of the evidence). Also, often the violation is based on prohibited conduct and not based upon the occurrence of a criminal conviction. For example, if a probationer is accused of DUI, and that charge gets dropped, the violation may be based upon the person's alleged use of alcohol (if the person was ordered to not consume alcohol while on probation) or driving a car (if the person did not have a valid license). If the reason for the probation violation is failure to pay money owed, the Judge cannot place the probationer in jail or revoke the term of probation unless the Judge finds both of the following: the probationer has not made a good faith effort to pay; and that the probationer had the ability to comply with the payment order without suffering a "manifest hardship". When deciding the existence of a "manifest hardship", the Judge is supposed to consider the following factors: if the probationer is currently employed; the probationer's employment history; if the probationer is actually employable; what the probationer is able to earn from his or her job; whether or not the probationer's failure to pay was willful; what financial resources the probationer has to pay; what are the probationer's basic living expenses (child support, food, shelter, clothing, medical expenses, etc. ); the existence of any other relevant special circumstances. An experienced probation violation defense lawyer will help you address these factors with the Judge, when the issue is relevant to your case. At a probation violation hearing, there are several defenses that may require help from an expert witness. An expert witness is someone who is determined to have some sort of special knowledge in a particular area (for example: scientific, engineering, medical, etc.) that may help the Judge in deciding a relevant issue. For example, if the issue is whether or not a probationer falsely tested positive to alcohol because he or she was exposed to industrial alcohol fumes at a work site, an expert witness may be able to lend support to the defense that the probationer did not intentionally use alcohol. Presenting expert testimony at a VOP hearing can prove difficult, and the probationer definitely need an experienced VOP defense lawyer to properly present such a defense to the Judge. If convicted of probation violation, at sentencing the Judge can listen to statements from the probationer, defense counsel, prosecution, probation officer, and the victim of the original case that lead to probation, before deciding on the sentence. An experienced probation violation defense lawyer can give the probationer important advice to possibly avoid or reduce any jail sentence by providing a carefully formulated probation violation sentence strategy. 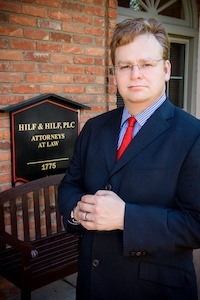 Why Choose Attorney Daniel Hilf For Violation of Probation Representation in Oakland County? If convicted, will provide great advice, thoughtful recommendations, and zealous advocacy to help possibly mitigate the Judge's sentence. The defense of probation violations is an skill that develops over time with preparation, planning, experience, legal acumen, and talent. Hiring the best probation violation defense lawyer may make the greatest difference in the probationer's future.